Midlands Farm Walk - a great success! 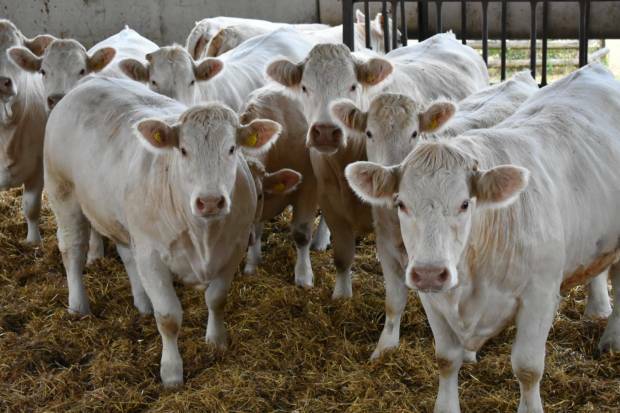 Over 60 farmers gathered at College Farm in Oxfordshire on Wednesday to view the exceptional Dorcas herd of Charolais. George Morris and family gave an fantastic tour of their immaculate farm, taking tractor and trailer rides through fields holding large groups of even cows with calves at foot. George explained their focus on maternal traits producing cattle with good milk, longevity and calving ease which could be seen from the quality of stock. The farm tour went on to showcase the home designed bull handling system, fully automated to allow for safe routine weighing and management of finishing stock. An impressive system using a curved race to keep bulls calm whilst handling with an adjustable race width so it can also be adapted for handling calves. Finished bulls could be viewed back at the farm buildings. Daniel Slade from Thame farmers market explained in his speech following the walk that the family aimed to produce U and R grade finished bulls with good cover to hit the retail specifications. The young bulls can easily achieve this within 15 months and heifers within 18 months and once bred heifers at 30 months. Finally visitors viewed the farms finished cull cattle. George explained the farms strict policy of culling underperforming cattle, including all cattle over 10 years old to allow for new genetics to come through into the herd. Cull cattle are brought in for fattening and due to their good size and finish fetch a good cull value, more than covering the cost of bringing on the replacement heifer. The farm walk was followed by a burgers, tea and cakes at the farms great lodge facilities. All in all a great evening of knowledge sharing and networking! The NBA would like to thank the event sponsors for making the evening possible, as well as the Morris family for kindly opening the gates to the Midlands NBA. A final thank you goes to Tom Elliott, Vice Chair of the Midlands Committee for providing the burgers and organising the logistics of the event. Check out some of our pictures of the evening here!